Oxford Limited has partnered with GO Stationery to produce a range of University of Oxford stationery items, accessories and gift wrap for the UK and across key European and international territories. The deal was managed by Oxford’s agent for the UK and Europe, Global Icons. “We’re really pleased to welcome GO Stationery to the Oxford licensing programme,” said Chris Evans, MD Oxford Limited. 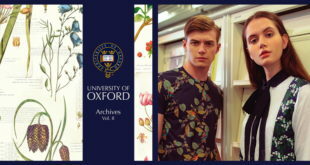 Design cues for the range have been taken from archival content supplied by Oxford’s Bodleian Library through to patterns inspired by a visit to the University’s Museum of Natural History. Designs generated originally by Oxford’s wallpaper licensee, Paper Partnership, may also make their stationery debut on products ranging from notebooks, folders and journals through to school bags, pencil cases, gift boxes and bags. "With a design studio and all of our manufacturing based in the UK, we take great pride collaborating with great British brands like Oxford,” added Sue Townsend, commercial director, GO Stationery.